Pure Dancing with the Stars » DWTS13 End-of-Season Award Winners – Which Dance Was the Worst? DWTS13 End-of-Season Award Winners – Which Dance Was the Worst? Heidi: Heh. I forgot Ron was even on this past season, so it would be difficult for me to call him the “worst” – maybe being utterly forgotten is worse than being the worst. 🙂 I always laugh when someone throws in Ricki and Derek for a “worst dance” category. She was not Derek’s best partner ever, but worst out of this group? LOL – I think a bit of envy is at play here. I will also freely admit that Maks’ and Hope’s behavior toward the end of the season completely colored my thoughts on their dancing and, frankly, them as people. But you know what? That is the risk you take when you persist in that type of behavior with no apologies. You have to own it. Be responsible for it. Like it or not, you’re on TELEVISION and what you do will have an impact on people, either positive or negative. Now, I’ve had a negative opinion on Maks before and he turned it (and me) around with Kirstie. He may be able to do it again. But how many times can one keep making the same mistake before they just get written off? So, at the end of the day, that is likely what you’re seeing in the number 2 ranking for Hope and Maks – unfortunately (or fortunately, depending on your POV) I’m rarely alone in my opinions or reactions. I’m just not that unique. 🙂 As for Tony and Chynna – I think people are very sympathetic with someone just blanking on someone and then feeling awful about it. Sympathy plays a huge part in this show, as we’ve said time and again. Plus, I think most people can see the difference between forgetting ones steps and being a “bad” dancer. I don’t think she got voted out for blanking, I just don’t think she had a fanbase to begin with and her previously good scores had been protecting her from elimination. Vogue: Wow, I’m shocked to see Maks and Hope’s Tango scoring so high for worst dance? 😯 But, looking back at it again, I was quickly reminded of her “attitude” which was turning a lot of fans off at the time including myself. I also thought Tony and Chynna’s Tango would have scored higher as “worst dance”. In the end, I agree with who won in this catagory. Ron didn’t even seem to care and Peta seemed to have given up as well on him which I didn’t fault her a bit. If she comes back this next season, I really hope she gets a good partner. I’d really like to see her given a good chance to teach. 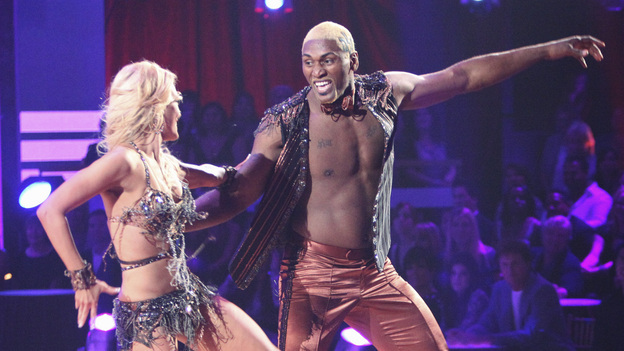 14 responses to "DWTS13 End-of-Season Award Winners – Which Dance Was the Worst?" Ricki and Derek’s samba? How on Warth was that even a thought for this one? True. If they wanted to add derek and ricki they should have siad their jive (instant one) or the 80s dance. @Dee(upclose22): I think that if people wanted to see Ricki and Derek on the lsit those would be the prime choices since those were her worst (or at least I think so). In no way are they the worst of the season but if people wanted to see them on thel sit those would be theo ens that should have been there. I was initionally confused on why J.R.’s cha cha was a choice but after watching it again….WOW. That could have cost him the trophy he shoud be thankful for the freestlye round. @vin – Yeah, Heidi & I both found his dancing in the finale (with the exception of his freestyle and maybe his instant samba) to be not up-to-par with the dancing he did the rest of the season…I guess he was still somewhat injured. I find it hard to believe that he could ace a difficult dance (samba) but flub an easy one (cha-cha) without some other external factors in play. His jive in the finale was kind of a train wreck as well – I think he actually flubbed his choreo towards the beginning, and missed a few steps later on. Oddly enough, I think Rob was the most consistent during finale week – not the best, but the most consistent…he didn’t have the same ups & downs the Ricki & JR seemed to have. Ron and Peta should be at the bottom, Yikes, just for the costume alone, SCARY! I agree about JR, his finale work was not too special, but nailing their freestyle sealed the deal. Chaz clearly was not the best dancer, but his smile warmed my heart. He did his best, and he was awesome. I have a theory about why JR seemed to deteriorate the last couple weeks, beyond the ankle injury. I know I held this thought about him that he was young and fit and after all he’d been through, this was nothing. But as I thought some about the truly living hell he’d been through, I realized that his body is probably *nothing* at all like a regular fit 28 year old. Burn scars aren’t flexible and with over 40% burned and scars likely over more than that because I would guess that they harvested unburned skin from his body for grafts, think how little flexibility he has and how much has to be “borrowed” from other parts of his body that aren’t really meant to be flexible. Also, scar tissue doesn’t sweat, it gets poor circulation…Also, I wonder if his lungs took a permanent hit with the severe smoke inhalation and who knows what all chemicals he inhaled while trapped. And to go through that many surgeries…I bet in some ways he’s a very old man and think that while he was accused by some of using a “sob story”, I think he did quite the opposite and really tried to avoid calling attention to his deformities and health problems. And while Derek and Cheryl excel at choreographing to show strengths and hide weakness, I think Karina, who no doubt truly loves JR, really threw a lot of very hard things at him that perhaps he was too tired and worn down by that point with that crazy dance schedule to really excel at them. It makes me sad that he’s kind of remembered by some as not such a good dancer, I wonder how well he could have looked in a different situation.